Kerala is quite another country. I sometimes wonder how the people of one state in the same country can be so different from those of the other states. Many years ago, as a child living abroad in Oman, I had heard that in the post office, there would be different mailboxes for letters going to India and letters going to Kerala. Clearly, the Arabs might have seen the difference too or it may have been due to the large influx of the people of this state in the Gulf countries. Whatever it may have been, I sense that difference every time I visit Kerala. A few months ago, I had taken a trip to my hometown in Kerala on account of a wedding I had to attend. I left Bangalore on a Friday night to reach Kannur on Saturday morning. It happened to be a hartal the same day, in protest of the hike in diesel prices then. Worse still, I had happened to land in Kannur with long hair falling on my forehead and a beard that covered the rest of my face. Obviously, I needed a trim to look clean and all; not that I was dirty otherwise but it just might appear to people that I am dirty from the way I looked. However, I was stranded at home from dawn to dusk, as the timing for the hartal goes. Around five in the evening just couple of hours before the mehndi event started, I decide to move around in search of a hair-cutting salon. It was fun getting out at the time. People had started coming out as if they had woken up from sleep. Some clearly enjoyed the day (yes, to some extent, even the ones who complain about the hartal). The traffic was not dense. I went up and down different roads. After riding for about 9 kilometres, I found a distinctly traditional “barber shop”; distinct because the kind of it was a rare sight these days unless I decided to go deep inside villages. The only barber in the shop also reminded me of a simpleton “Barber Balan” from a beautiful Malayalam movie “Katha Parayumpol” which I had watched just a few years back. Perhaps, all of Kerala is like that and I never noticed it because I did not take the time to look at it. There is something simple about the lifestyle and the attitude of people. The next one hour or so which I spent at the barber shop became moments of patience and relaxation for me. As I sat down waiting for my turn, I saw that there was a teenager with long hair (at the back of his head) already there before me. He would smile at me whenever I looked towards him. At first, I found it awkward. But then, I got used to it and started responding with a smile as well. I tried to assess the barber’s proficiency in the work, by looking at him cut the hair of an old man, who was the barber’s first customer of the day as he would mention to me later. I soon realize that I am not good at judging a barber’s work. I had never been able to find the right barber for me. I had already come to the conclusion that it is just a myth. The best I could probably do was to get my hair cut at the same place by the same barber every time. At least that way, my hair wouldn’t look different every time I had it cut. On this particular day, time was of the essence. It would not be seen lightly if I got to the mehndi function too late. I finished browsing the Malayalam newspaper by the time the first customer was done. The teenager was next. He explained what needed to be done, to the barber. He would still give a look at me through the mirror and spread that shy smile of his, which I had gotten used to by then. I smiled back generously. I noticed that the first customer, the old man who was probably in his sixties, had not left after paying. He sat down beside me looking at the barber cut the teenager’s hair. It did not take much time. The long hair at the back was supposed to be left like that. The rest of it just needed a bit of trimming which was easy to do with the “Made in Germany” trimmer. I sighed with relief seeing that the barber had a trimmer after all. “When a man gets old, people stop noticing him unless he is doing something different. My hair is not even greying. I thought I should do something like this now.” The old man explained. The barber and I laughed at this. The old man smiled in acknowledgement and left. My haircut was already in progress by then. A conversation then ensued at my initiation. “So, you opened your shop just now?” I asked. “Oh!” I was aghast at the thought of a student dying due to violence. “I haven’t seen you in this part before. Where are you from?” The barber asked. I told him where I came from and how I reached his shop. “I don’t believe in keeping the shop shut for the entire day. I was watching cricket on TV and my wife asked me if I would be opening the shop at all. And I came out right then.” I had sensed in him a hesitation to talk when I started the conversation. However, he seemed to have gotten past it. “I have been in this area for quite some time. The youngsters sometimes come and when they see me, they leave. They think this old man can’t cut their hair the way they want. The modern way. But most people do not know that I trained in Bombay and I went to one of the best institutes in India.” The man did not look all that old. He was probably in his mid-fifties. I reflect that I too was hesitant to get my haircut there, when I first saw him. I kept nodding, as I listened. “The owner of this shop has branches in Saudi, Dubai and Kuwait. And one more shop in Kannur.” And many such tidbits also came out of the barber. He eventually came to the topic of hartal. By this time, the fourth customer also joined in the conversation. The truth, I realised that day, was that people need not worry any more about opening shops on a hartal day. They need not worry about taking their vehicles out on the road. They need not stay at home all day. If any violence or vandalism is reported against those not following the hartal, the party which called for the hartal or the person who was involved in the violence/vandalism must compensate for the loss or damage caused. These were strict orders from the High Court of Kerala and had already been enforced several times. So, the perpetrators of hartal were very careful not to cause any damage. They worked on creating a sense of fear. If any destruction was to occur, the one affected could report the case against the person who caused the damage or loss. If the person cannot pay, the party would have to pay for it. However, parties are known to absolve any knowledge of the person or his affiliation to the party. This puts the person and his family into trouble. Many of them would have found it hard, if they were to face charges as they barely had the means to support their daily lives. Kerala, which is probably also the “hartal capital” of India, has not become so only because of the political parties. To a large extent, it was also due to the people who have gotten used to these “holidays” which always seemed to come up just when they needed it. The people liked to relax. They like to take their time off every so often. It all falls into the simplicity of their lives. The moment a hartal is announced, people prepare for it. They fill their vehicles with fuel. They rent a few movies to watch. They get all the stuff they need for the day. It is a celebration, even for those who like to complain and rant about it. As I pay the barber and prepare to leave, the next customer asks me, “Where are you from?” I tell him the whole story again. His reply is “God must have had something in his Infinite plan. It is destined that you would be the source of income for this man here today.” I muttered “goodbye” and left the place, somehow feeling good and at least a tad more cheerful than I had been when I entered the place. Later in the evening, it was past eight when I entered the house where the wedding function was happening. It was Mehndi night and there were a lot of fun activities happening. I sat aside and away from the rest of the crowd and looked at the people around me. I marveled at how different and casual life was. 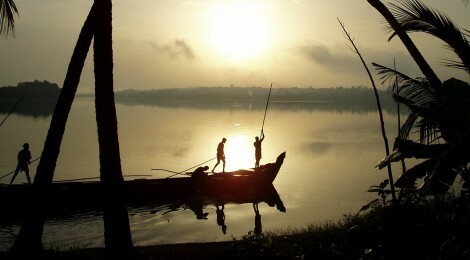 In Kerala, the living in life takes first place; everything else takes a backseat. It was a different country and a different culture. No one was in a hurry. There would always be tomorrow.